While television is still considered an important medium of information and entertainment, things seem to be changing as the adoption of smartphones is increasing with each passing day. 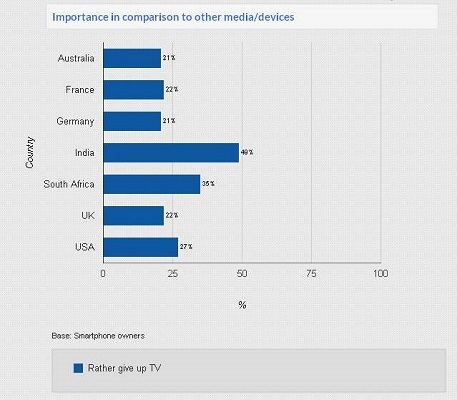 Apart from making calls, texting and emailing are the basic features that users perform on their smartphone, about 49% of smartphone owners from India are willing to give up their TV to do more with their sleek devices. This number has been revealed in a survey conducted by Google – IPSOS and India goes on to leave behind major smartphone markets like the US, UK and Germany where the maximum number stays under 27%. The survey also goes on to reveal a fact that a whopping 56% of Indian smartphone users find their smaller devices more entertaining than the television. In comparison, countries like the US (21 percent) and the UK (18 percent), or even neighbouring nations come nowhere close to India’s enthusiasm. When we talk about the penetration of smartphones, the number is higher amongst the males in India but it the women in India who are leading the usage of smartphones over TV. The usage and loyalty behavior of the users revealed that 58 percent women found their smartphones more entertaining than the television. Women in India are not just watching shows online to entertain themselves; rather, they are using smartphones to find information on where to hangout with friends, connect with them over social networks, and shop online. The male smartphone owners from India are not far behind when it comes to using the smartphone over the television and more than 55 percent of them are glued to watching videos on their devices. 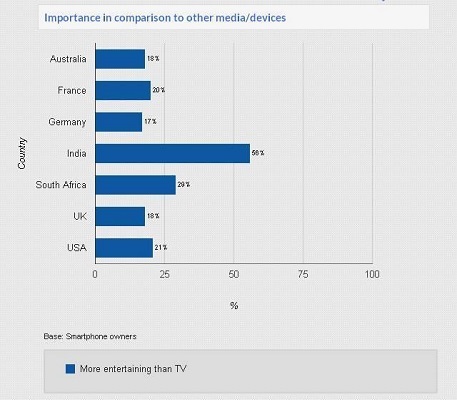 Indeed some interesting facts that Google has gone ahead and revealed in the survey and it shows how much value Indian smartphone users give to devices and are not just glued to the TV sets for entertainment.